Just released! Two new kits. KIT 1. ON SALE FROM 19 SEPTEMBER 2017. 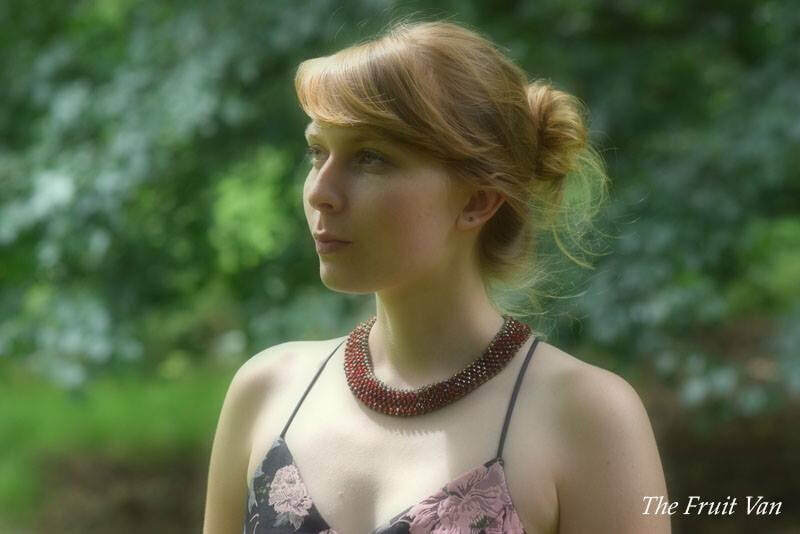 ​Make your own elegant crystal collar. 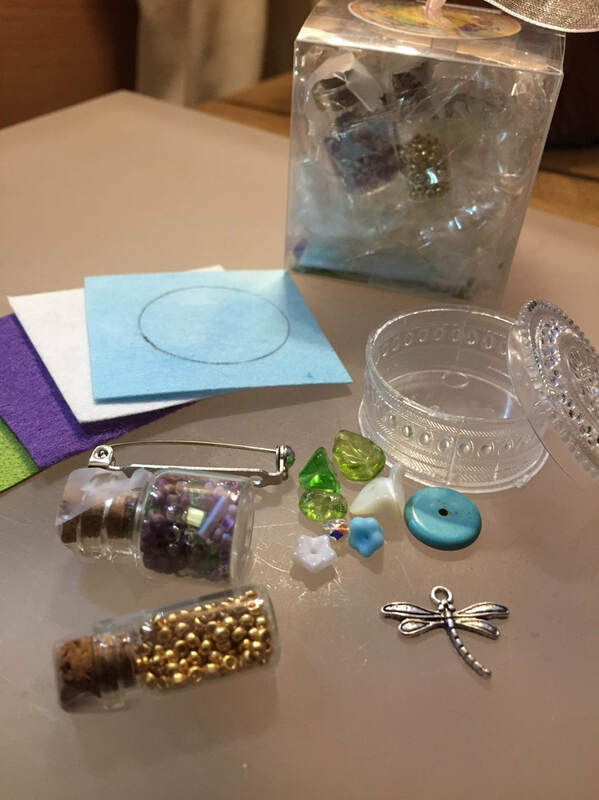 ​The first kit is for the Adventurous and Patient Beginner who'd like to try bead weaving, or also a very lovely kit for more experienced beaders. Everything you need is included, except scissors and pliers. 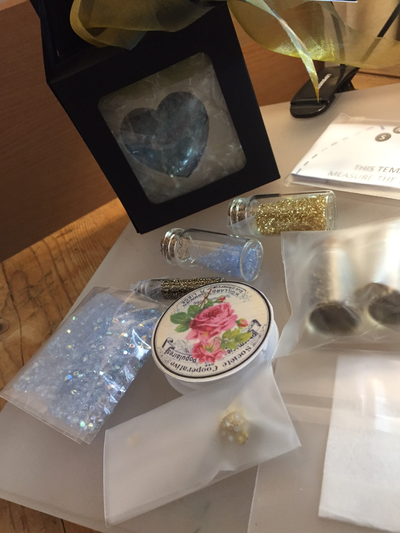 Contents include 500 crystals (2 sizes), all the seed beads needed for the project, thread, size 10 long beading needle, magnetic clasp and other findings. The kit also includes a template as a size guide for a small, medium or large size. 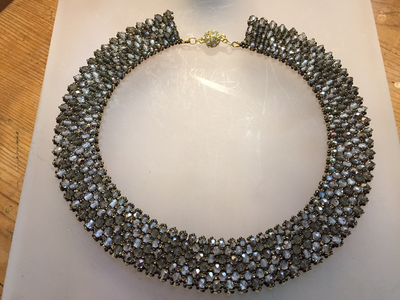 There are sufficient beads and crystals in the kit to make a large collar. Full video instructions are provided with the kit. Inside the kit you'll find a password giving you access to the private area of my video tutorials site. There you'll find four tutorials covering the materials needed for the project. 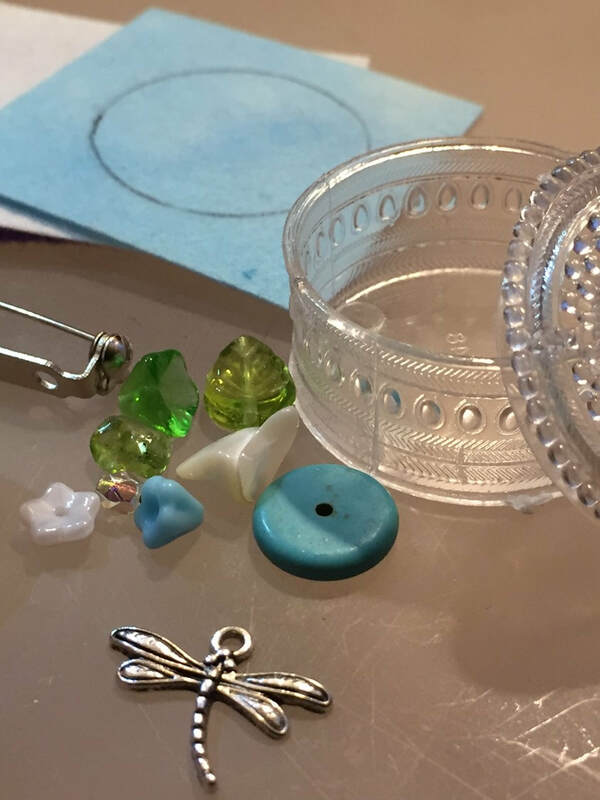 Once you've made your first collar, you can buy your own crystals and make more collars whenever you wish. After the materials and equipment list, you'll see a tutorial on how to make the netted foundation, then a separate tutorial on adding the crystals to the front of your collar, and finally a session on how to finish your piece by attaching the clasp. 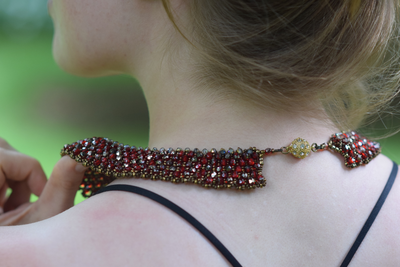 ​The collar is very versatile as you can wear it on both sides as a day version or a night version. Click through to my web shop for details on buying the crystal collar kit. ​Colours | Available in baby pink, baby blue, black diamond (pictured), or garnet red. Make your own little bead embroidered element. 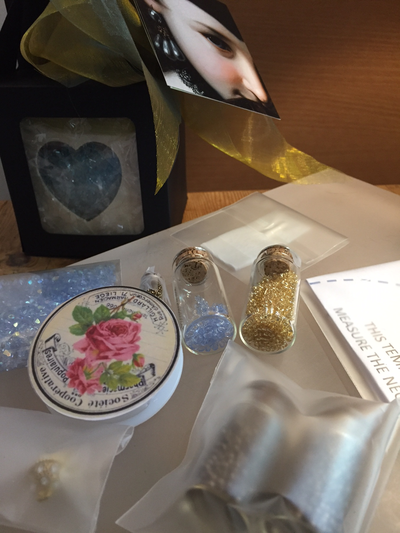 This kit is for absolute Beginner level beaders, or even for more experienced beaders who want some light and relaxing beading. 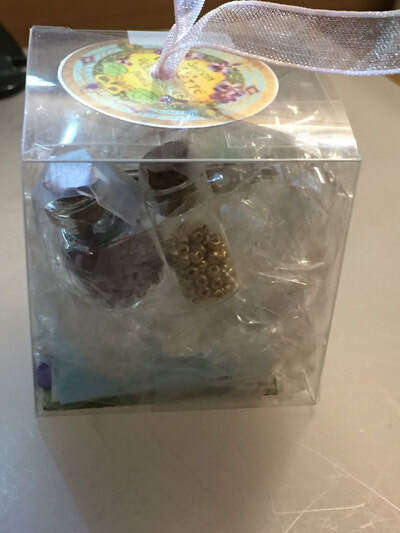 The kit includes two tiny bottles of seed beads (one for the front of the piece and one for the edging), a little box of treasures to include in your project (some glass flowers, a leaf, a semi-precious stone, a crystal and other cool stuff), plus a charm. 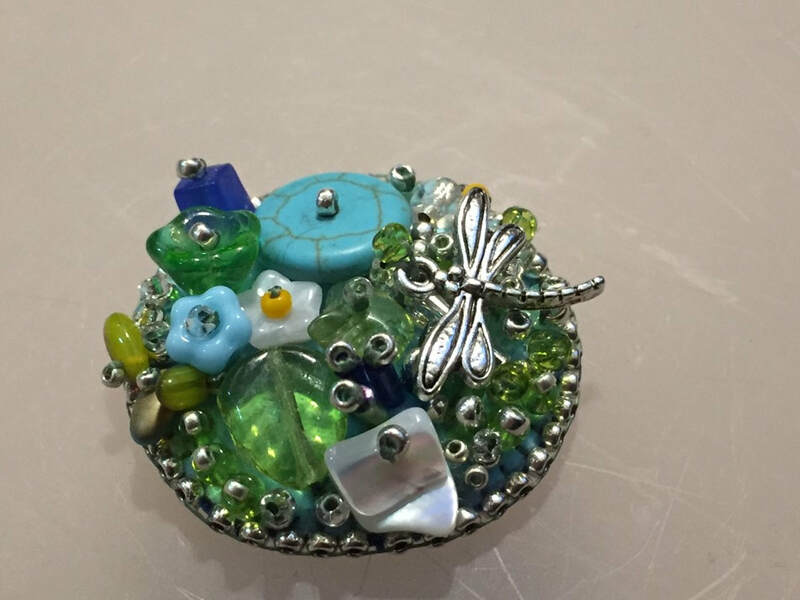 This is the DRAGONFLY kit, so a little silver dragonfly is included. 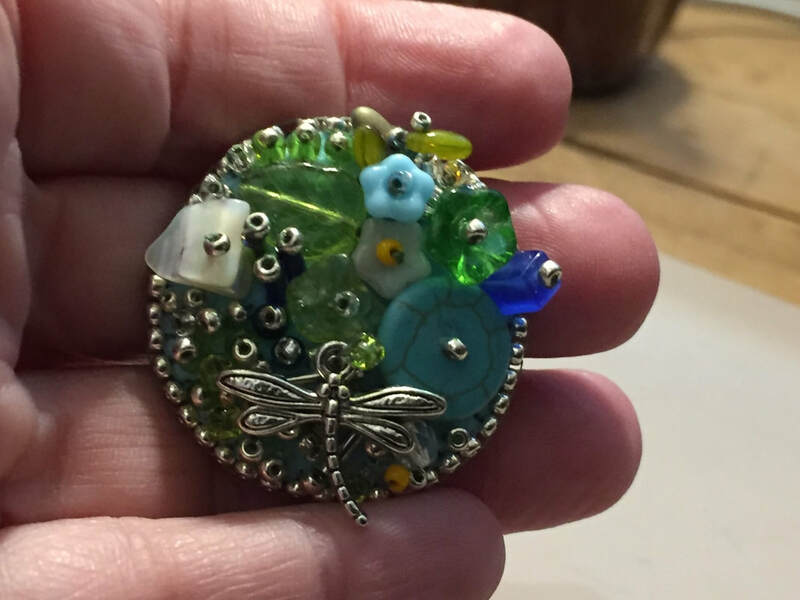 Please let me know if you want to do a little Lamb, or a Butterfly as I can swap charms if needed. Also included is a square of beading backing, felt for some padding, and a little piece of Ultrasuede for the backing of your finished piece. Finally, a brooch fitting is included so you can turn your little bead embroidered element into a pin if you wish. You need to provide needle, thread, scissors and some glue - all the materials you need are listed in the How-To videos. Full video instructions are provided with the kit. Inside the kit you'll find a password giving you access to my private tutorial site. 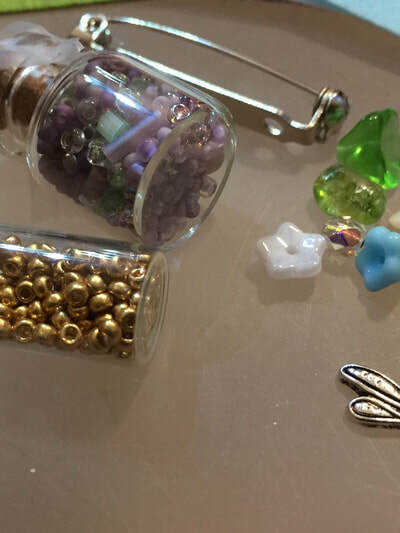 There you'll find five tutorials covering basic bead embroidery materials, followed by four videos showing how to do the most frequently used bead embroidery stitches. The sixth video is how to make the project. ​This is a terrific little project. You can make the element as a pin, a pendant, or make multiples and make a truly 'wow' necklace. Make a few and give them away to friends. 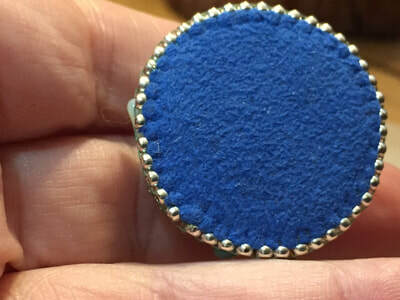 They really are super cool and useful as embellishments and work well on scarves, bags, gloves, hats, cards, or to incorporate in quilting, etc. ​Colours come in green/blue, mauve/green, pearl/gold. This is the DRAGONFLY kit. 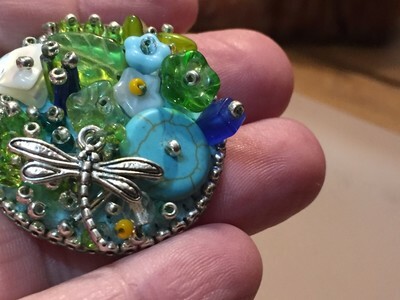 You can select Dragonfly, Lamb, or Butterfly.